-Reduce Slip and Fall Accidents! 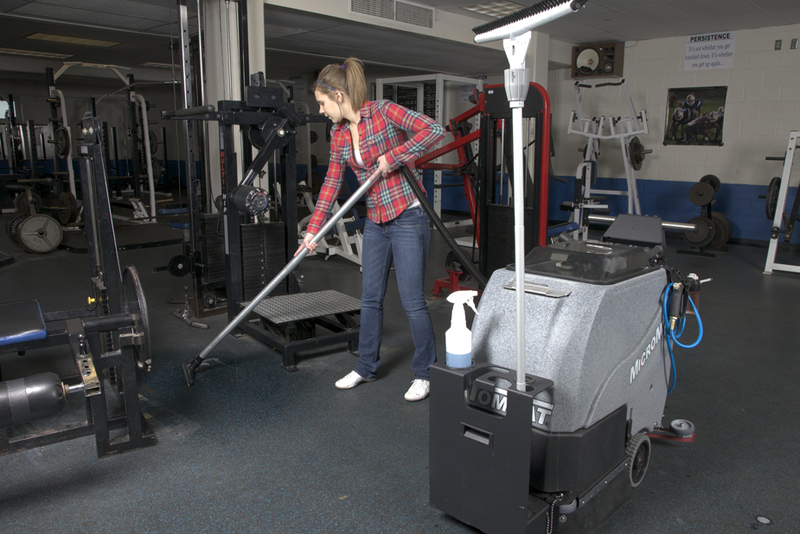 The Clean Caddy Sanitation System is a battery-powered, self contained cleaning system designed for portable cleaning applications such as restrooms, locker rooms, display cases, shopping carts, wheel chairs, kitchens, fitness rooms, etc. The Cordless Clean Caddy Sanitation System is one of the latest evolutions in mobile inegrated cleaning systems and the best-in-class solution for touch-free restroom cleaning. The Clean Caddy system cleans much faster and has a much less environmental impact that most automated systems. What is the Clean Caddy Sanitation System? Tomcat's cordless Clean Caddy allows you to quickly convert your MicroMag automatic scrubber into a universal remote cleaning station. The Clean Caddy is an option that easily installs in seconds, and without any tools. Just as quickly it can removed and stored in a janitor's closet. 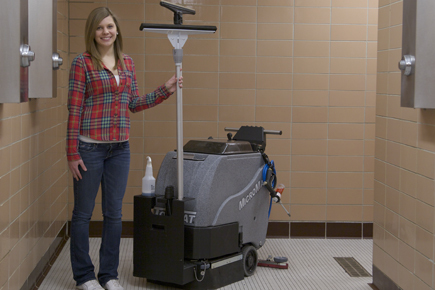 Unlike other "No-Touch" machines, the MicroMag is a battery powered Auto Scrubber first. One of the primary complaints building maintenance professionals deal with is unsanitary and smelly restrooms. It is no surprise they can also be hazardous to human's health, as the bio-hazards are quickly transferred throughout the building. Many studies show that old fashioned cleaning with mops are ineffective at removing contaminates, and often are the source for spreading bacteria. 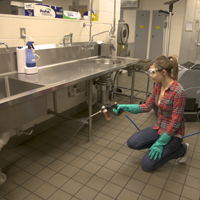 Increase operator productivity with Clean Caddy's onboard tools, while allowing them to enjoy less physical contact with the soiled surfaces. You can count on more regular cleaning with a device as simple as Clean Caddy, which eliminates those foul urine odors. It also brings more respect to the janitorial staff and safety. 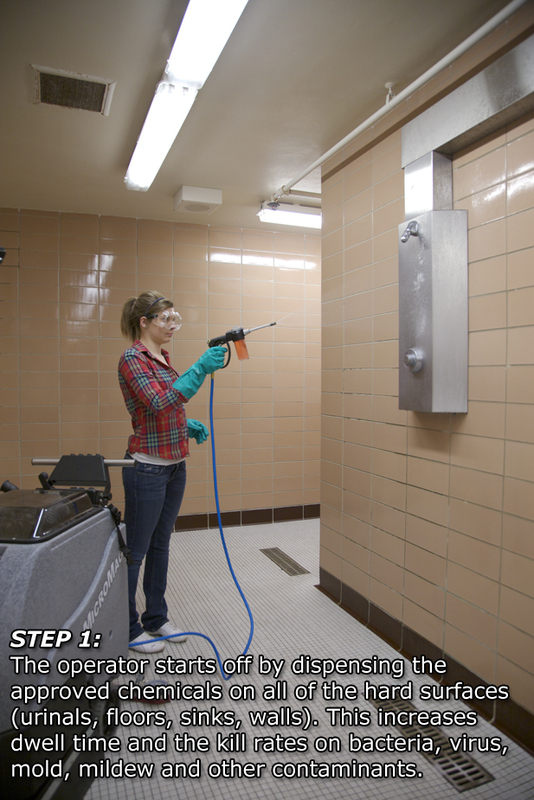 The Medium-Pressure (100 PSI) spray gun doesn't damage fixtures or grout, and reduces the risk of spraying back contaminated water into the operator's face. The 24 volt battery system provides long run time, greater safety and freedom from the restrictions of extension cords and limited wall outlets. 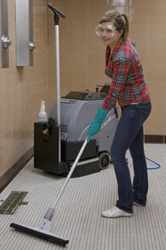 No need to remove the clean Caddy to use the MicroMag as a traditional scrubber. 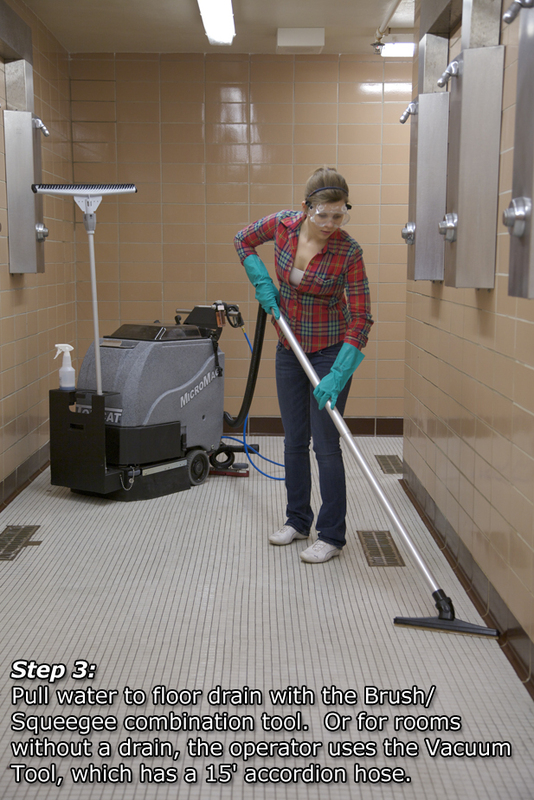 Schools can eliminate the need for extra equipment by simply ordering their MicroMag (17" or 20") with the optional Clean Caddy. 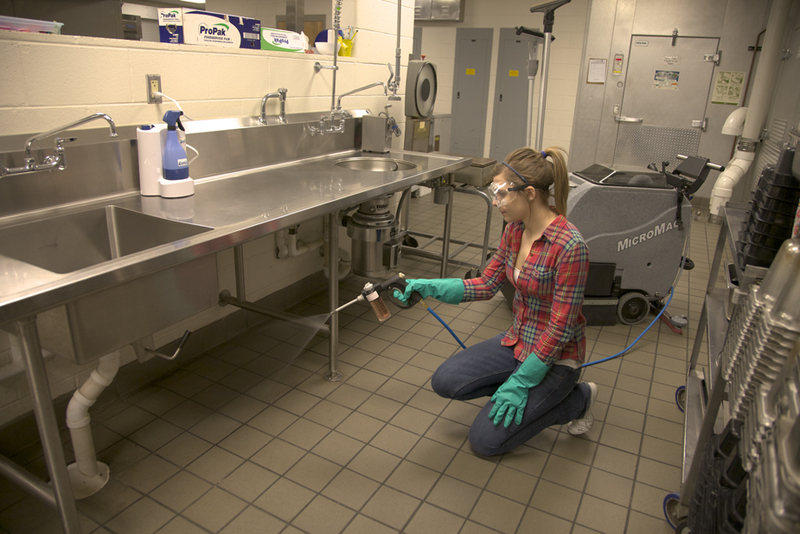 Kitchens and Cafeterias' difficult to reach areas are more thoroughly cleaned with the handy tools and the janitors enjoy a more respectful task. 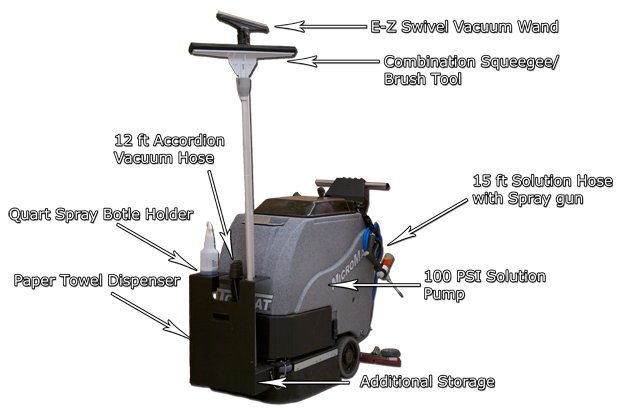 The Clean Caddy's method has been documented to be 3x faster than conventional cleaning, which is helpful as janitorial staffs are asked to do more with less. 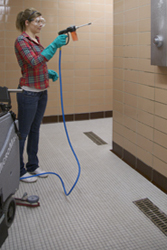 The operator starts off by dispensing the approved chemicals on all of the hard surfaces (urinals, floors, sinks, walls). This increases dwell time and the kill rates on bacteria, virus, mold, mildew and other contaminants. 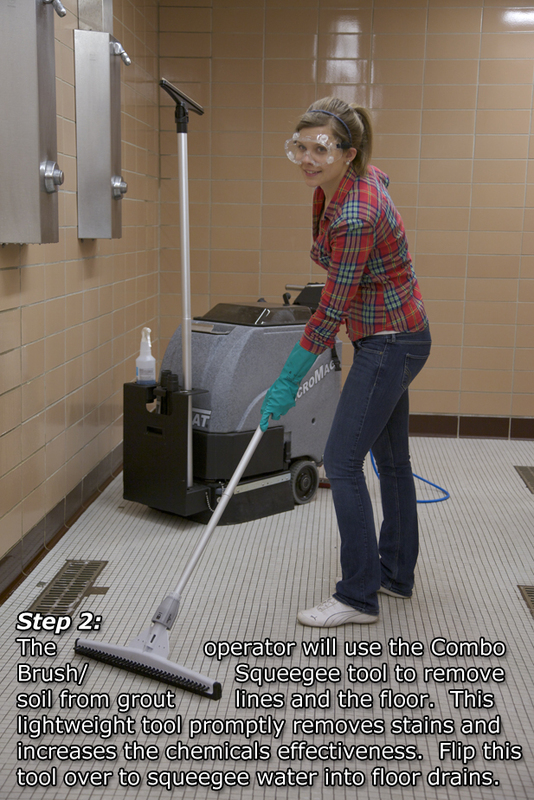 The operator will use the Combo Brush/Squeegee tool to remove soil from grout lines and the floor. This lightweight tool promptly removes stains and increases the chemicals effectiveness. Flip this tool over to squeegee water into floor drains. Pull water to floor drain with the Brush/Squeegee combination tool. Or for rooms without a drain, the operator uses the Vacuum Tool, which has a 12' accordion hose. Where is the Clean Caddy Used?